You know what needs to be done. You know it is keeping you up at night? What is keeping you from taking the next step? A conversation I have had with numerous business owners centers around their interest in getting their companies beyond their present existence, how they don’t have this or that or some other thing and that they are working far too many hours. They feel like they are doing “okay” but that they could be doing better if they only had some other thing. One thing about small business – there will always be one other thing that that is needed – time, people, money, expertise, etc.. What it boils down to, however, is simply the fear of taking the next logical step.What separates those that achieve their goals from those that live in dreamland is often just taking time to tie up your sneakers and make the leap. When you run a company, surely there are risks. The path is hard. Things always seem to change. There is no clear path to success. Competitors are constantly popping up and the marketplace can be fickle. Taking that next step can seem like the most difficult challenge in the world. Should you be afraid? Yes. Fear keeps you sharp. It keeps you watching. It can be a motivator. Think about the last time you tripped. Was it the act of tripping that caused you to react and correct yourself…or the fear of falling and hurting or embarrassing yourself? Afterwards, did you continue to walking, or did you stay where you were to avoid tripping ever again? 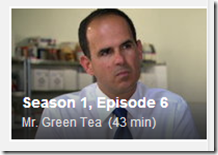 A recent episode of CNBC’s “The Profit” highlights a company called Mr. Green Tea, a 50 year old gourmet ice cream company that serves the Asian restaurant industry. In this episode, businessman Marcus Lemonis is working with the owners to help them determine what the next steps will be with the company. At the onset of the program, the company was on track to gross about $2.5M, however the company was unable to move forward due to limitation in manufacturing. Here is the clincher: the founder, Mr. Santo Emanuele started in the gourmet ice cream business out of the desire to sell gourmet ice cream to the restaurant business. He had a friend named Reuben Mattus who was also interested in the gourmet ice cream business, but wanted to sell to retail outlets. The two couldn’t come to an agreement, so they decided not to work together. Mr. Emanuele went on to start Mr. Green Tea. Mr. Mattus went on to start…wait for it…Häagen-Dazs. What happened? This has everything to do with fear. Fear that kept Mr. Emanuele from joining Mr. Mattus to build what has ultimately become a multi billion dollar company. Mr. Emmanuele took the conservative approach, minimized his risk and took steps wherein he could contain that risk. He dwelt on his fear. It paralyzed him. It kept his company from achieving its potential. Mr. Mattus probably had fear, too. But he also had the courage to go out and pursue his dream. Someone told me once that courage is simply fear that said its prayers at night. It is courage that overcomes fear. It is courage that makes people pursue more. Mr. Mattus wanted more. The risk he took probably could have bankrupted him a number of times over. It wasn’t as though he was wealthy when he started out. He started his business in the Bronx, New York, and opened his first store in Brooklyn. He had three flavors. In 1959, he started his company. In 1983, his company was bought by General Mills. The difference, again, is fear. There will always be risks when running a business.. There are lots of things that can go wrong. There are lots of unexpected twists and turns along the way. But there are also opportunities. Like Mr. Mattus, you can shoot for the moon and grow something that is extraordinary. It doesn’t have to be a multi-billion dollar, multi-national story. It may not grow up overnight. Are you facing a fear of growing your company? Are you afraid that you don’t have the time, resources, knowledge, experience or something else to make it happen? Are you struggling with hiring the right help – an admin, a bookkeeper, a marketer…a consultant?